Centering around a hit man, who models his life and philosophy around the ancient Japanese Samurai warrior living and operating in New Jersey, sees himself the target of the local mafia who take hum bridge for a hit that left a loose end. 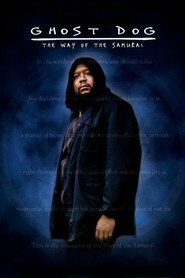 Forest Whitaker plays the self titled, Ghost Dog, who lives on a roof top caring for his homing (or as they call them in the USA ‘passenger’) pigeons. It is through these pigeons that he signals his master, or handler who hands him out the various jobs he has to do. He works off a retainer, paid annually, to keep the paperwork to a minimum I imagine. The movie is full of long lingering thought provoking scenes which sets the tone of the main character. This man who has decided to live in the shadows and follow a moral code that highlights just how unjust the world is. He witnesses many incidents as he dredges through his days. This would be great, if it wasn’t for the Key Stone cops mafia that are pitted against him as his foe. I mean they are just comical but unintentionally so. Every single American-Italian cliche you can think of, its here. The godfather figure (Henry Silva), who says very little, but looks intensely before giving his orders, to the old cripple side kick, who shouts racist and obscene rants that everyone must tolerate. For some reason, these lot always meet in a Chinese kitchen with the owner demanding rent from them! Add in the running theme of them all being addicted to old cartoons on the TV. It is just stupid. Stupid, because it detracts from the excellent and intense performance from Whitaker. He does his role perfectly, but deserves a much better gang to go up against. There are some questionable scenes that you wonder, what the hell was that for. The one that comes to mind is when he bumps into two hunters who are struggling to load a shot bear into the back of their pickup truck. Adds nothing to the overall narrative. How does one sum up this movie? Could have been excellent but fails to deliver because of the supporting cast. Was hoping for far more for my 60th movie in this series.